Your atmosphere is a little off. To start, it's a bit of a lean mixture Oxygen-wise. Earth's atmosphere is 21% O₂. If you drop below 19.5%, side effects start showing up in humans. At 15%, any physical activity will leave a human exhausted very quickly. Earth's atmosphere is 390 PPM CO₂. That's 0.039%. Anywhere from 4-6% CO₂ is a lethal level for humans. In fact, you're not supposed to be exposed to higher than 0.5% (5,000 PPM) for any length of time. As to what you're asking about how weather would be affected, some of that depends on the presence or absence of a moon. On Earth the moon is the main contributing factor to tides. If there's no moon, your coastlines will be subject to a good deal less tidal erosion. Another thing to think about is tropical cyclones (hurricanes, typhoons, etc.). Tropical cyclones serve as a kind of heat engine, moving it away from the tropics into the temperate and arctic zones. With a tilt as extreme as your world has, you're going to have much hotter summers. That, combined with the shallower oceans, means you're going to have hotter water in the tropics. That will lead to both a greater number of storms and a greater intensity of those storms compared to Earth. A bit of googling returned me this image of Earth with an axial tilt double than what it is today, close enough to your case. 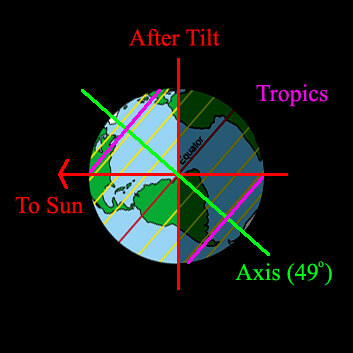 Note that the polar circles would be closer to the Equator than the Tropics. As you can see the seasonal differences would be rather extreme: during summer the day would be longer, while in winter shorter than what we have on Earth. In the tropics in particular during summer you would have 28 hours day around solstice, with therefore very high temperatures, while in winter you would have 28 hours night, again around solstice, with extremely low temperatures. I am not sure that the minimum temperature would stay at 80 F in these regions during winter, even taking into account the inertia of the atmosphere. Maybe the amount of CO2 in the atmosphere can set a sufficient greenhouse effect to keep temperatures high. With an axial tilt of 53 degrees, one thing to note is that the planetary average temperature would be similar all over, with little difference between the equator and the poles. However, the seasonal variation difference would be intense. Not the answer you're looking for? Browse other questions tagged planets climate astronomy weather or ask your own question. Would Floating Islands Dampen Waves on a Water World?